Fiberglass is the most widely used home insulator, and is also used to reduce noise transfer from room to room. Fiberglass insulation comes in both batt and blown forms. Anchor Insulation installs fiberglass insulation from Johns Manville, Knauf and CertainTeed. ComfortTherm® fiberglass insulation from Johns Manville is both a thermal and acoustical insulator that is both lightweight and Formaldehyde-free™. Made of long, resilient glass fibers bonded with an acrylic thermosetting binder, ComfortTherm® is wrapped in plastic for more comfortable installation with less itch and dust. With features such as a Class A rating for low flame spread, being composed of at least 25% recycled glass and Energy Star rated, ComfortTherm® continues the JM tradition of promoting better indoor air quality and a healthier indoor environment. Johns Manville Climate Pro® Formaldehyde-free™ blown in loose-fill fiberglass insulation is a premium alternative to cellulose. It can be conveniently blown into attics, nonconforming spaces and hard-to-reach areas, like corners, edges and around framing. Properly applied, you be assured that your home is energy-efficient, with minimal heat loss. Unlike most forms of cellulose, Climate Pro® will not hold moisture and will not permanently lose R-value. Climate Pro® does not appreciably settle, decay, or provide food for animals or microbes and is effective for the life of your home. Knauf EcoBatt with ECOSE (Greenguard™ Certified)-Knauf EcoBatt® Insulation doesn't look like any insulation you've ever seen. Its natural brown color comes from ECOSE® Technology, a revolutionary, new sustainable binder developed after five years of research. Using bio-based binders in the product rather than non-renewable petroleum binders, this product does not contain phenol, formaldehyde, acrylics or artificial colors used to make traditional fiberglass insulation. Knauf Insulation has been recognized for meeting the GREENGUARD™ For Children & Schools certification standard. InsulSafe SP® from CertainTeed is a fiber glass blown in insulation used in residential and commercial construction as a thermal and sound absorbing insulation. It is designed for pneumatic installation in open (attic) and closed (sidewalls/floor) construction cavities. It may be used in retrofit applications. Available in two primary forms: Loose-fill cellulose is often used to insulate attics. 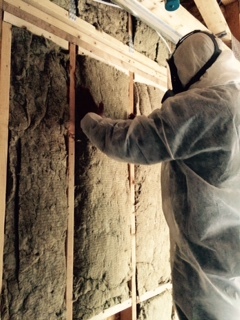 Stabilized cellulose insulation is used to protect your entire home including sidewalls. 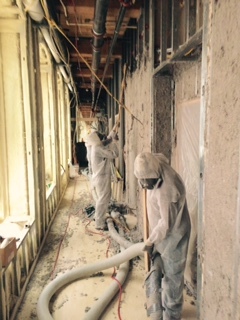 Anchor Insulation installs cellulose insulation from GreenFiber. GreenFiber Cocoon Cellulose - it is possible to achieve greater comfort and lower energy bills at the same time, through tighter construction and better insulation. Whether it's our dense-pack cellulose used for insulating attics, or our stabilized insulation for protecting your entire home, GreenFiber Cocoon insulation is made from 85% recycled paper fiber, mostly recovered post-consumer content, the remaining 15% are additives for fire resistance. The borates added to provide flame resistance and are non-toxic and it contains no formaldehyde or asbestos. Contact us today for your fiberglass and blown in insulation needs. Our offices and crews located throughout Rhode Island ( RI ), Massachusetts ( MA ) and Connecticut ( CT ) look forward to speaking with you, and helping you find the right product.